Black Omen is a melodic black metal band coming from Eskişehir in Northwestern Turkey. They were formed back in 2000 and in 2003 they released a self-titled demo. Their debut full-length “When Pure Darkness Covers False World of Light” was out in 2005, followed by “Sinphony” in 2007, both released by the Turkish label Poem Productions. 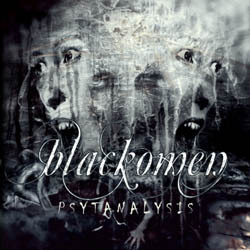 After a 5-year absence the band returns in the end of 2012 with a new singer and its 3rd full-length album “Psytanalysis“. The band has improved a lot its production and “Psytanalysis” sounds much more professional than its predecessors. The albums contains 10 songs and lasts almost 40 minutes. Black Omen’s music is based mostly on the guitars, whose rhythmic riffs and melodic lines dominate their sound. Their orchestrations are rich though, since they use a lot of synths and piano (keys), but choose keep them in the background, giving more space to the guitars. This works very good in their songs and their music is very melodic, without becoming overloaded. There are also a few eastern music elements in a couple of songs that I found very interesting, especially in the track “Shadow Over Existence“! Some instrumental and acoustic atmospheric passages add a bigger variety in their compositions, making it an easy and pleasant to listen album. Vocals remain in the brutal black metal side, with a few guest female vocals on the song “Spring Rains“. Their lyrics are in English, dealing with dark emotions and fantasy. Overall Black Omen have managed to release a very decent album of melodic black metal. If you are a fan of the genre, you better check them. You will not listen to something you’ve never listened to before, but their compositions are very good. With a more powerful and better produced sound things will become much better for them. “Psytanalysis” is self-released by the band in standard jewel case edition CD-r with a 4-page booklet, including all their lyrics. You can visit their official profiles below for more info and sound samples.